After Tokyo we took the bullet train to Kyoto. Kyoto used to be Japan's capital and is home to a lot of temples and shrines. It is not surprising that Kyoto is a popular destination for tourists, because this is where you can find almost everything associated with Japan, from zen gardens, to kimono's, to colourful shrines. 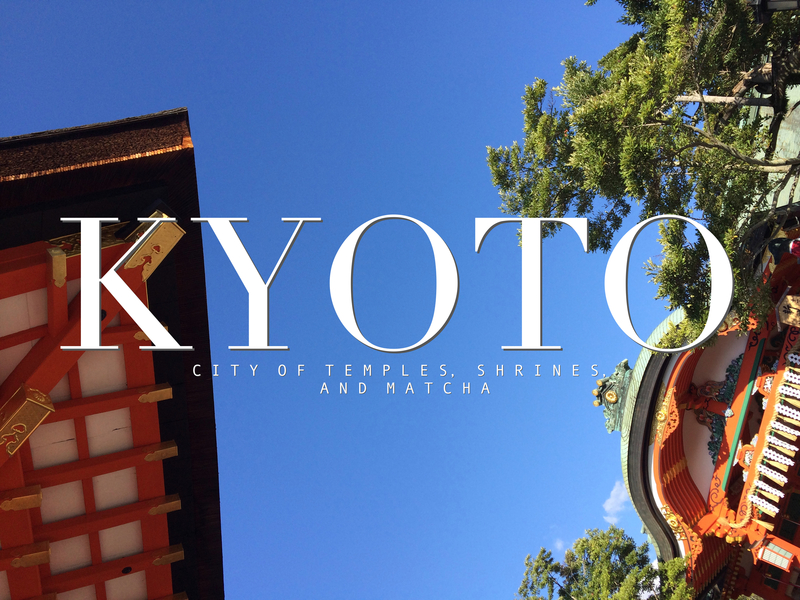 Kyoto is not nearly as big as Tokyo and one of the easiest ways to get around is by bike. The city is quite flat and there are lots of quiet roads where you can cycle safely. At the most famous temples and shrines you will find a special bike parking lot, so it shouldn't be too difficult to park your bike somewhere safe. I didn't know cycling was a thing in Japan, and so I was quite surprised to see lots of cyclists in almost all places I've visited on my trip. I stayed in Len hostel, which is equally trendy as its sister venue, Nui hostel, in Tokyo. The hostel is located very close to the area of Nishiku Market, which is the place to buy typical Japanese souvenirs. Nishiki market is a covered market with little shops that sell interesting and sometimes quite odd looking types of food. Something that's very big in Kyoto is matcha. Matcha is very finely ground type of green tea, and is said to have certain health benefits. You can buy matcha in other places, but in Kyoto you'll be able to get almost anything with matcha, like matcha Kitkat, matcha Oreo's and matcha frappuccino's. In the shopping streets around the market you'll be able to find kimono's, pottery, Japanese fans and so on. In this area you'll also find arcades where you can play video games or take pictures in a photo booth that will make you look like a manga character. The bamboo grove in the west of Kyoto is one of the many beautiful sights the area has to offer. The grove is really a quite magical place and leads up to Okochi Sanso house. The house is owned by Okochi Denjiro, a famous samurai actor, and is surrounded by a magnificent garden filled with Japanese maple trees. After you've visited the garden you can go to the tea house for a traditional cup of matcha tea and cake. This is probably the most touristy place I've visited during my trip through Japan, but it was definitely worth it. It's the head shrine of Inari, the god of rice and patron of business. Leading up to the inner shrine is a path lined with thousands of torii, which are traditional Japanese gates. Each of these gates has been donated by a Japanese business. Fushimi-Inari Taisha is a fascinating and mysterious place, and I would definitely recommend going there. If you feel like getting away from the crowd you should go to Kurama. Kurama is a small village in the mountains about 30 min from Kyoto by train. The main attraction is the buddhist temple Kurama-dera, but if you visit Japan in autumn, like me, you'll also be able to see some beautifully coloured autumn foliage up here. From Kyoto we travelled to Himeji, Okayama and Naoshima which you'll be able to read about in my next post! | 2016 © Merel Theisen | All rights reserved | London, United Kingdom.